*I'm so happy that it's now October, one of the most magical and fun months of the year. I really need to start decorating soon to get my new house into the "spirit" of things (ha!). *Speaking of religions, if you don't know mine, I'm Mormon, and this weekend is General Conference, which is a semi-annual broadcast from Salt Lake City, Utah featuring inspiring talks by church leaders and beautiful music mostly from the Mormon Tabernacle Choir. I love General Conference. It's really uplifting, comforting, and motivating. And I like having the BYU Channel so that we can watch it from the comfort of our home! *We've decided that we're ready to adopt two dogs from an animal shelter. My beloved dog Christy of almost 15 years passed away in May before we moved and I still miss her so much. She'll always be my favorite dog ever. I'm ready to honor her memory by opening my heart and home to two sweet dogs in need. It's been fun to look at the listings for the dogs. We've narrowed it down to a pair of black labs who are brothers that have a very strong bond with each other. I can't wait to go and meet them next Saturday! *For fellow Dancing With the Stars fans: I was a little scandalized by "Boo-gate" this week. I think Sarah Palin got booed, not the judges, even after seeing the clip they showed on Tuesday's show trying to explain what happened. And I couldn't believe how bad Michael Bolton's jive was. Talk about embarrassing! It should have been him to go last week, not The Hoff. Bummer! *This week there have been lots of little ladybugs crawling around on the window screens. I don't know why there are so many of them all of a sudden. But if there's going to be a bug infestation, I'll take ladybugs over just about any other insect! *My father is here visiting us this weekend on his way back to Massachusetts after spending the last month-and-a-half in Utah, California, and Las Vegas. I'm trying to get my mother to come out for Thanksgiving. If I fail in this endeavor I will be very disappointed in myself! *My baby Sam has another cold this week, courtesy of his big brother John, who I'm sure got it at school. I'm seeing an unfortunate pattern for the coming school year: John brings home a bug, gets mildly affected by it, and Sam gets hammered by it. Fortunately I have a little weapon to help when colds strike. Have you heard of Boogie Wipes? Boogie Wipes are the best! They're wonderful for wiping stuffy, runny little noses with. They're super-soft and they're not made with yucky chemicals, and they can dissolve stubborn little boogies like nobody's business. Ironically, one of the things I like most about them is their (pre-boogie) scent, which is surprisingly pleasant and fresh. 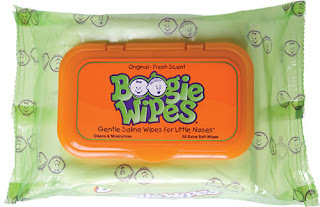 No, this isn't an advertisement, but I do highly endorse Boogie Wipes! You can use them for your own nose too. I do! I hope you've had a good week! For more Friday Fragments go to Half Past Kissin Time. Happy Friday!